In September 1939, the US Army was ill-prepared as far as armored vehicles, training and tactics went. Soon, it became clear that a new model, which could be favorably compared to the European models, had to be studied for mass production. The very early M1 Combat Car was nothing more than a very small tank with two machine guns. Its main purpose was scouting and, as such, ordered for “cavalry” units. This was in 1937, and became the forerunner of all light tanks to come. None of the 147 M1s built saw action, but were used as training machines. The last M1A1 version was equipped with a 37 mm (1.45 in) gun, a new engine and turret. 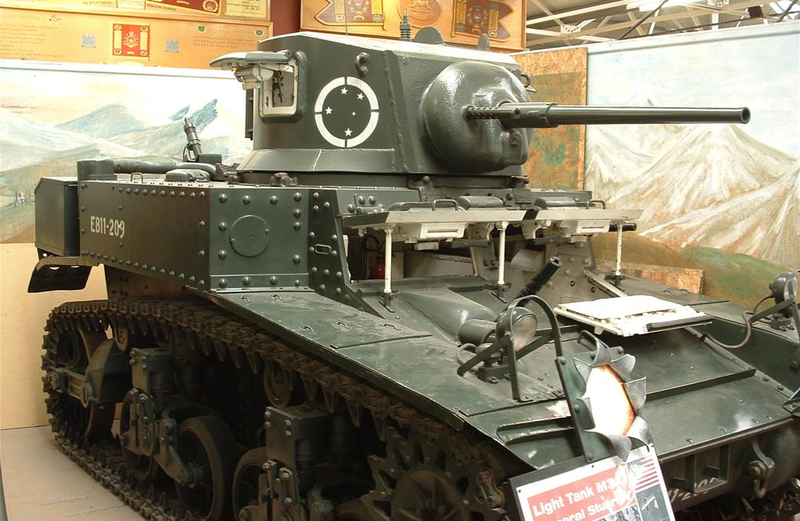 In 1935, a new model, the M2 Light Tank, was designed. At first, it was an immediate upgrade of the M1, but with the heavier .50 (12.7 mm) caliber machine gun, immediately followed by the M2A2 with twin turrets equipped with .30 (7.62 mm) caliber M1919 machine guns. 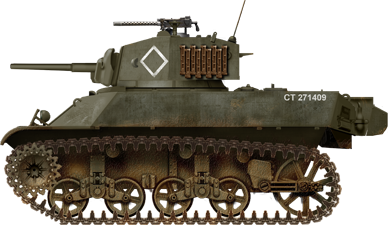 The “Mae West” gave way in 1938 to a small series of M2A3 37 mm (1.45 in) single turret tanks, and then to the final M2A4 in 1940, with improved armor, motorization and equipment. These fought at Guadalcanal with the US Marine Corps, and with the British Army through Lend-Lease, performing well in Burma and India against the Japanese, despite being obsolete. The M3 was built under the light of recent events in France. The quick fall of France, due to inadequate tactics, quickly led the US Army Corps to think about a new doctrine, which led to an independent US armored force. From the material point of view, the latest M2A4 and the M3 were both designed to be more effective than only infantry support units. Officially, the cavalry corp was integrated in this new armored force and the official “cavalry tank” designation replaced by “light tank”. Their main duty was scouting and screening. 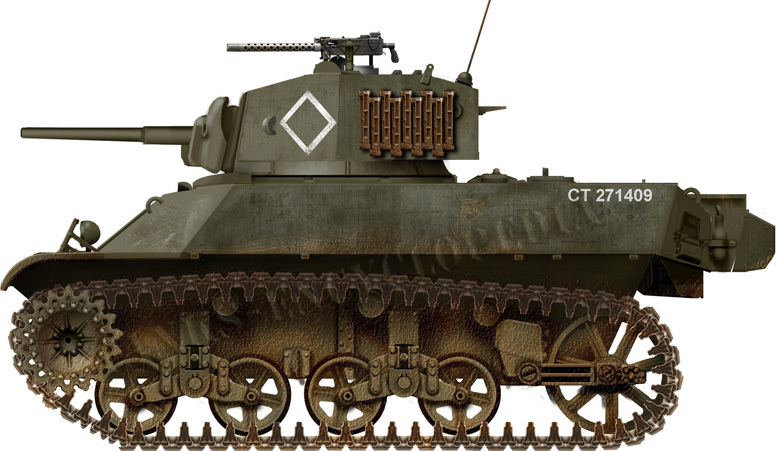 The M3 was, at first, a simple upgrade of the last M2, with a more powerful Continental petrol engine, a new vertical volute spring suspension system and up to four machine guns in addition to a main, quick-firing M5 (and later M6) 37 mm (1.45 in) anti-tank gun, with a new gun recoil system. In fact, the latter gun had a relatively low-velocity and had no armor-piercing ammunition. It was also used on the M2 medium tank, but was clearly insufficient compared to other European medium tanks. For a light scouting tank this was a good asset, especially when compared to German Panzer I and II for example, although the M3 was quite heavier and better protected. The secondary machine-gun armament was impressive, with five manned by the four crew members (driver, co-driver, gunner and commander). One of these was co-axial, another in a ball mount in the right bow, two others were mounted sideways in fixed sponsons and, later, one on an anti-air M20 turret mount. But, in practice, in order to save weight and free space on board, the two sponson machine guns were often removed. The Rolled face-hardened steel side armor was 1 inch (22 mm) thick. The rear was 1 inch (25 mm) thick. The upper front of the hull was 1 1/2 inch (38 mm) thick. The armour behind the drivers and machine gunners hatches was 1 inch (25 mm) thick but the two front hatches were 40 mm thick. The lower front angled glacis plate was 1 3/4 inch (44 mm) thick. The sides and rear of the turret were 1 inch (22 mm) thick. The front was 1 1/2 inch (38 mm) thick and the gun shield added and additional 1 1/2 inches (38 mm) or armor. The M3 was the first production model. 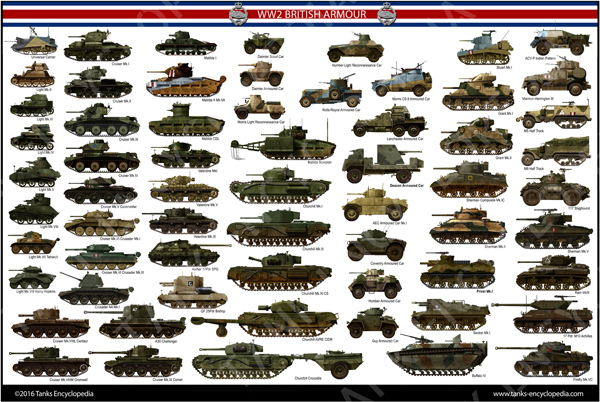 Most of these were provided to the British and Commonwealth forces through Lend-Lease. Some were immediately thrown into action in Northern Africa, where they immediately became popular for their speed, sturdiness and reliability. Although the official British designation was “Stuart”, paying homage to Civil War Confederate general J.E.B. Stuart, they found themselves affectuously dubbed “Honey”, because of their smooth ride. But this nickname never stuck with the US Military. Despite of this, all following tanks provided to the British received a Secession War general name and the tradition stuck up to 1945, finally being adopted by the US army itself. 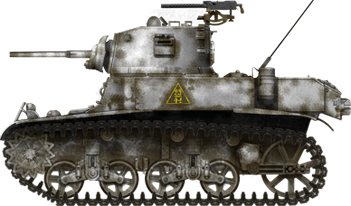 After many trials, the first production M3 was delivered in March 1941. 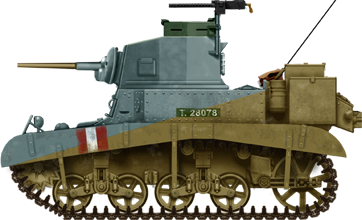 5811 M3s (Stuart Mk.I in British service) were produced, including 1285 equipped with Guiberson diesel engines, more efficient in the long run for desert operation, on a British specification, and called Stuart Mk.II. A turret basket was added, however this does not refer to an external feature, but to the internal parts that rotated along with the turret. The gunner and commander sat in it. All M3 Stuarts were produced by the American Car & Foundry Co. 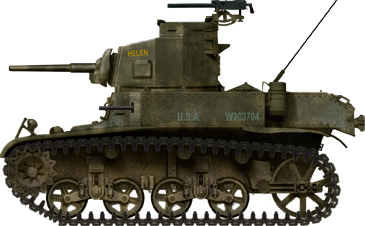 The M3A1 was introduced in May 1942 and had an improved turret design, including the “turret basket” and a higher M20 M1919 AA mount. From that point, the sponson machine guns were removed, as the three remaining machine guns were judged sufficient for the task. 4621 M3A1s were produced, the last delivered in February 1943. 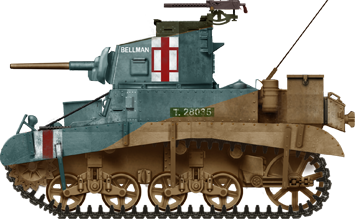 They were largely distributed to the British under the Stuart Mk.III designation, while the diesel variant was named Stuart Mk.IV. They also had an improved gun vertical stabilizer. US Forces used many of them in their first major operation in the west, the North African invasion in November 1942 (Operation Torch). They had some success against Italian tanks, but were butchered by German 88 mm (3.46 in) artillery and the up-gunned Panzer IIIs and IVs. It was clear that the high profile, flat squared hull was too vulnerable. 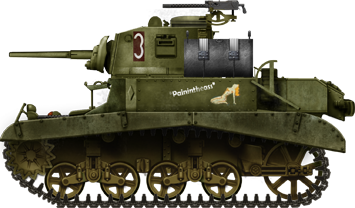 As a temporary measure, before replacement by a newer model, the M3A3 was introduced. 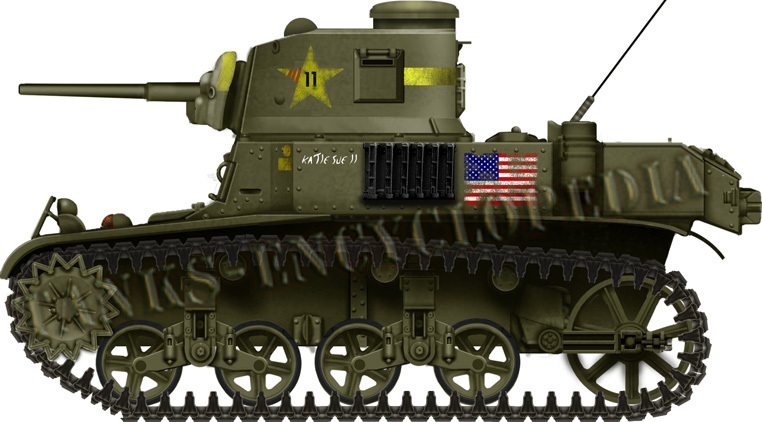 The M3A2 was only a paper project with an entirely welded hull. 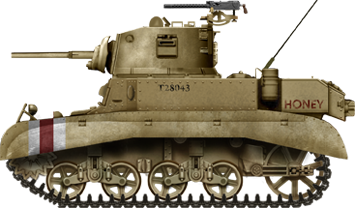 The M3A3 benefited from the improvement in hull design which was introduced with the M5 light tank. Its main feature was a 20° sloped and thickened welded hull, which greatly improved their survivability. It was just slightly heavier, but easier to produce than the original one. They also had a turret rear overhang to house a radio. The M3A3 hull was also roomier, and this space was used to add more fuel and ammunition storage. Regular storage amounted to 174 rounds for the M6 gun with M44 mount and 7500 rounds for the three M1919A4 machine guns. The turret originally had a basket, but crew practice was to remove to free space. 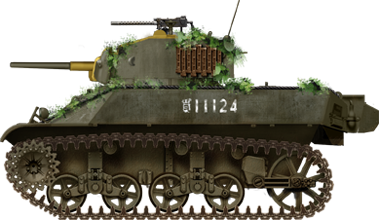 3427 were produced, the last one leaving the factory in October 1943, and in British service it was called Stuart Mk. V. Through the year 1943, all regular units operated only as scouts and were gradually replaced by improved M5 tanks. There were many variants. These included the British turretless Stuart MK. I to IV, also called Stuart Recce, personal armored carriers called Stuart Kangaroo, mostly used by Anzacs, and a command turretless version (“Stuart Command”) with extra radio equipment. Many British Stuarts operating in the desert had additional spare parts, ammunition, fuel tanks or extra tracks as protection. On the US side, there were several attempts to produced howitzer equipped versions and several Gun Motor Carriage prototypes, all of which were dropped. One prototype, the M3 Maxson turret version, had a quad .50 cal (12.7 mm) machine gun AA mount, but remained experimental. However, 24 units were produced of the Satan, a flamethrower conversion of the M3A1 for the US Marine Corps. These tanks were used in the Pacific, as well as the A5R2-M2 model, with the flame-thrower replacing the hull machine gun. There were also an US turretless command tank conversion and a bulldozer version to clear barb wires. Many more versions were derived from the M5. The first series M3 was a cavalry tank and, as such, not meant to deal with other tanks, but only occasional infantry and other scouting forces. But, with no less than five .30 caliber (7.62 mm) machine guns of the highly reliable M1919 type, in addition to a rapid-fire M5/M6 37 mm (1.45 in) gun, the M3 was a deadly package in itself, despite lacking heavy firepower. The standard livery was khaki-olive, with 1943 US identification markings. The white or yellow turret band was a common feature, with special markings for some units. Extra fuel and extra tracks were mounted for long range missions and, to save weight, the hull side machine guns were often dismounted and the hatches closed. The M3A2 was not produced. 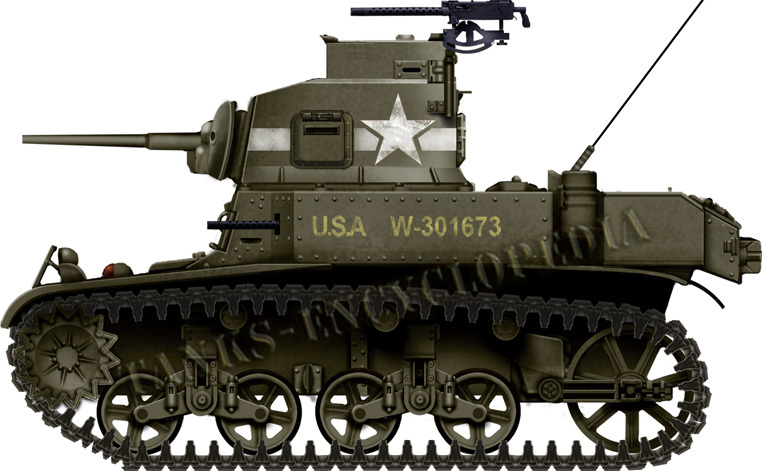 The M3A1 was an improved version, heavily produced until the end of 1942, when the M3A3, designed alongside the M5, was introduced. This one served during Operation Torch of November 1942 in Northern Africa. 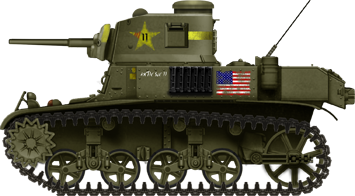 They had the standard olive drab livery with large American markings, as there were some French resentments against the British, but not the Americans, so large markings were made apparent. A special anti-air M20 mount, modified turret (without the turret basket) and additional fuel tank and spare tracks were also often seen. 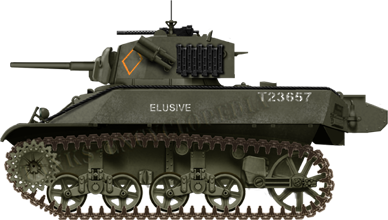 Large amounts of M3 Stuarts were delivered through Lend-Lease to the British and Commonwealth. British Stuarts were packed with extra equipment and had the standard straight lines pale blue-sand livery, with grayish green upper surfaces. Once their limitations were well-understood, they performed reasonably well against the German-Italian forces of Rommel thanks to their speed, reliability and endurance. 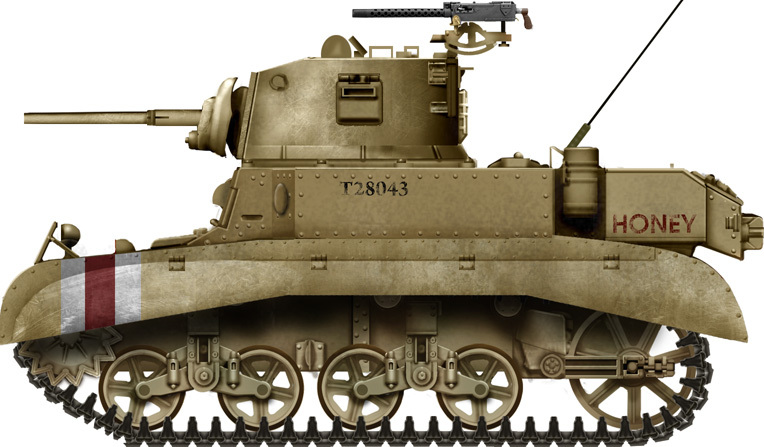 The highly upgraded M3A3 was the last version of this light tank before being completely replaced by the M5. The two tanks shared similar sloped hull armor and turret, but the M5 was more powerful, quieter and more comfortable. The sloped armor and new turret were both thoroughly tested improvements, which greatly compensated for the lack of armor. Critics, however, still argued that their main gun was no match for any German tank of the time and their still high profile made them easy targets, despite their improved speed. These reasons, among others, explain why these tanks were most of the time relocated to the Far East, India and the Pacific, where they could deal more easily with Japanese tanks. In the European theater, these tanks were used in conjunction with the more powerful M4 Sherman medium tanks, as screening and scouting armored wings. The 13,800 M3s built saw action extensively throughout all Allied operational theaters, from North Africa in 1942 to the Pacific in 1945. 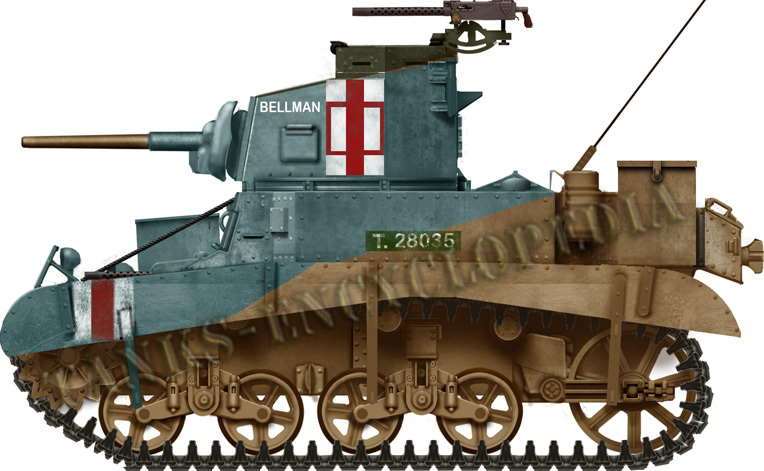 Against most German AT guns and upgunned Panzers, the British and Australian Stuarts were converted for other uses, put in screening forces or transferred to the Asian theater, in India and Burma, where they were still a match for Japanese light tanks. The US Army too found them vulnerable in Northern Africa and limited their operational assignments to rearguard, flanking or reconnaissance formations around the main M4 units. Crews were well-aware of their weaknesses and avoided combat against other tanks, as well as heavily fortified positions. The M3s found themselves largely employed in the Pacific (while being replaced by the M24 Chaffee in Europe), mostly due to the conditions found there. Their light weight was more suitable for the bad tracks of the jungle and their opponents even more lightly armored, lacking efficient anti-tank weapons. The only one which could cause trouble was the 45 mm (1.77 in) gun of the Shinhoto Chi-Ha and the SPGs based on its chassis. The earliest tank to tank battles occurred in the Philippines in December 1941, where M3s put up a fierce resistance with the 192nd and 194th Light Tank Battalions, mostly against Ha-Go tanks. 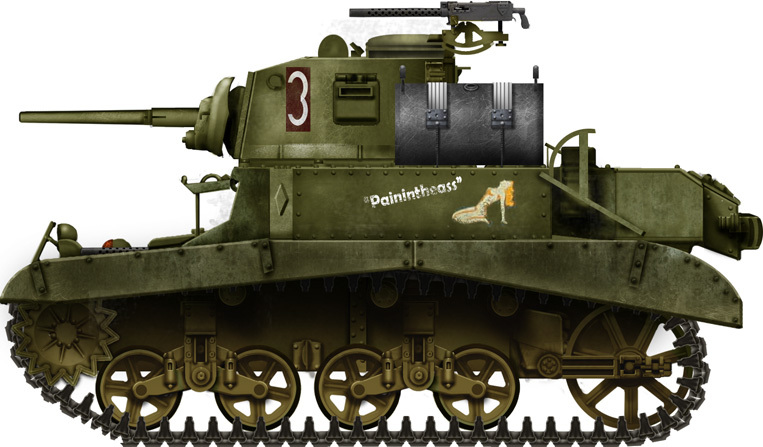 Along with The M3 Lee and M3 Half-track, the M3 Stuart was sent via lend-lease to the Soviets, with just under 1000 units of the light tank being recieved. The M3s recieved were from various production series, identified from their turrets. Early shipments featured tanks with the D38976 welded turret, following this they would have the D58101 turret, with later delveries featuring the D58133. 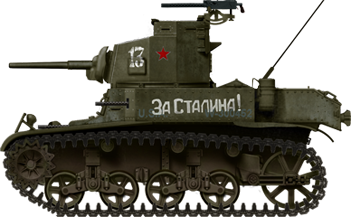 The Soviets designated the tank as M3L (L = Legkhiy: Light). It was not especially liked by the Soviets, so much so that they turned down later American proposals for M5, and sent them to the Manchurian front. Criticism included weak armor and weaponry, narrow tracks not suited to the Russian winter or muddy autumn, and flammable high-octane, non-standard aviation fuel. 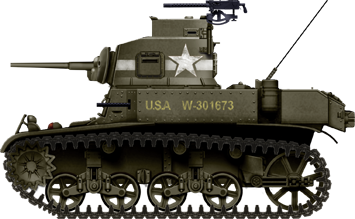 Resembling a wide-angled hull, scaled-down Sherman, the M5 was a clear improvement over the early M3. Despite retaining many features from the M3, including the turret, tracks, suspension and most importantly the weak 37 mm (1.45 in) gun, the M5 was largely improved, with a brand new powerpack – two Cadillac V8 automobile engines, more reliable and less subject to catching fire than the previous Continental aviation engines. Transmission with hydramatic (automatic) system was also smoother and easier to deal with. It had a new sloped, welded hull, which was comparatively roomier, also making the interior quieter and cooler. The sloped glacis, with almost no significant increase in protection thickness, was the main asset of this new version. It was first introduced in 1942 and production lasted until 1944, with an estimated 8,885 units, of which many saw service under foreign colors. 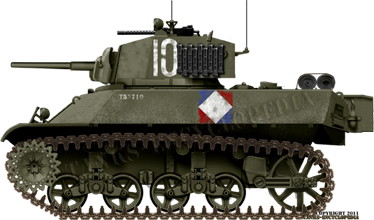 Besides the British and Commonwealth Stuart VI, there were also the M5A1 and A2 in Chinese, Free French and Free Italian service. Most South American countries received Stuarts after the war, including Brazil, which improved them greatly under the seventies X1A major upgrades. M5s still in active service were documented as far as 1996. British Stuart Mk.I “Bellman”, 8th King’s Royal Irish Hussars, 4th Armored Brigade, 7th Armored Division, Operation Crusader, North Africa, November 1941. British Stuart Mk.II (M3 with diesel engine), VIIIth Army, Gazala, May 1942. M3 “Helen” from Company B, 192nd Tank Battalion, Philippines, December 1941. Helen was the tank of Sgt. Willard von Bergen. He was originally an Illinois National Guardsman and died as a Japanese POW. The tank was named for his wife. None of the tanks in this unit had stars on them. Courtesy of Jim Opolony. Late M3 light tank operating in southern Italy, early 1944, with a D58101 turret featuring all the original five machine guns. Late M3 “Painintheass”, 3rd USMC Tank Battalion, Bougainville, Pacific, November 1943. The very same tanks were also engaged at Guadalcanal. Standard 1942 M3A1 during “Operation Torch” (invasion of Vichy France’s Northern African colonies) with large invasion US flag painted on its hull. A Soviet Lend-Lease M3L (L = Legkhiy: Light) in 1942. 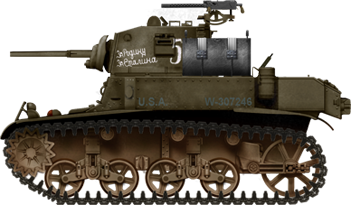 Soviet Lend-Leased early production M3A1. Soviet Lend-Leased late production M3A1 in winter livery, Leningrad sector, early 1943. Australian Stuart Mk.III “Honey”, first battle of El Alamein, June 1942. British Stuart V “Elusive”, 22nd Armored Brigade, 7th Armored Division, Normandy, June 1944. A Free French M3A3 from the 1ere Armée (General De Lattre de Tassigny), Provence, August 1944. The Free French received many M3s and even more M5s, just like other Allied forces during WW2. Canadian Stuart V from the Sherbrooke Fusiliers, 27th Armoured Regiment, 2nd Canadian Armored Brigade, Normandy, summer 1944. 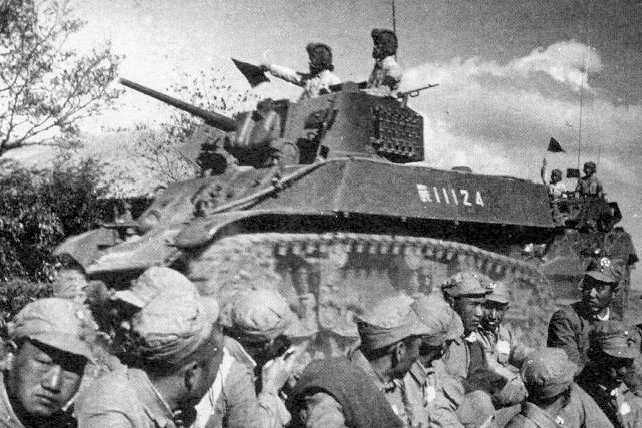 Chinese PLA M3A3, south-eastern China, fall 1944. 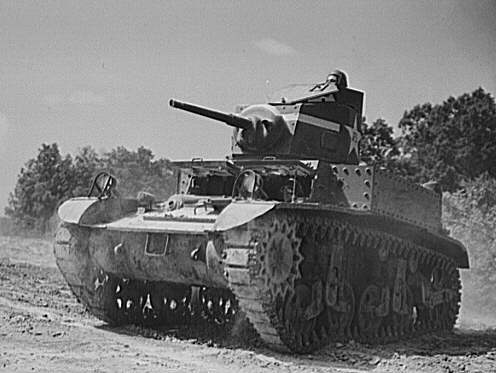 The story that British troops nicknamed the M3 Stuart the ‘Honey’ because it was a ‘sweet’ ride compared to the other tanks they had to drive is often debated. Ed Webster has found a number of WW2 period British Newspapers where the tank is clearly called the Honey tank. Churchils, Cromwells, Matildas and many iconic or little known British vehicles are featured! Purchase now ! It IS a brazilian Stuart. Dunno why it was labelled as such, but it’s indeed a Brazilian Stuart, corrected. Can you please clarify the use of the term “turret basket” in your description? 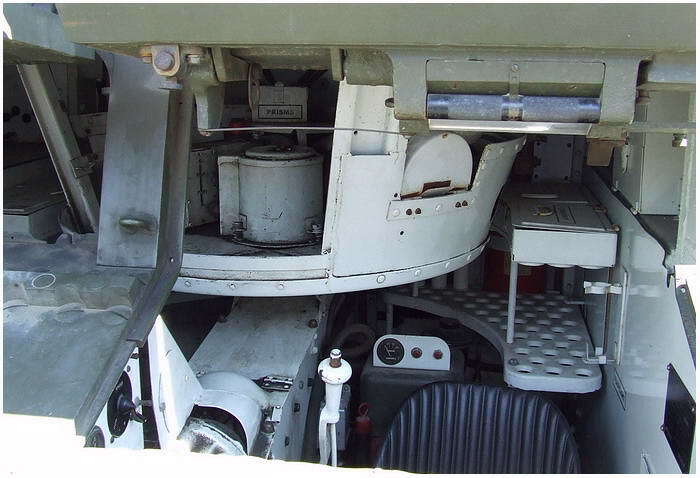 I understand it ( being a trained tank soldier) as the part of the turret that hangs down into the hull to hold the seating for the gunner and commander. From your use of the term I get the feeling that you are describing the extension of the turret called a “bustle” used to accommodate a larger gun or sometimes radios. Except the M3A1 didn’t have a turret cupola Danie. And I know, our description was wrong and implied something totally different. But thank you for trying to answer. I apologize to both of you that it took us so long to answer you. The turret basket in discussion is actually a turret platform on which the gunner and commander sat. However, instead of being at the same level as the hull floor, the turret basket floor was higher. Hi folks, the colour picture of the Brazilian “M3A3” is actually an M3A1 – the Bovington tank does not have the sloped sides or fully sloped front glacis of the M3A3.